One of the challenges of drawing figures is that it is a problem solving activity that requires us to be flexible in our approach. Because no two drawing scenarios are the same, we must learn to creatively think of various solutions to solve each individual “drawing problem”. When working from life, we also face the added challenge of having to do this quickly, as we rarely have unlimited time with the model. With practice you will learn to generate as many solutions as there are poses. You will begin to identify the most important elements in a pose, and recognize which to start with that will allow the rest of the drawing to progress efficiently and smoothly. For example, if the line of the shoulders is very prominent, you may choose to begin your drawing there. Perhaps there is a dynamic movement essential to the gesture of the pose that you start with. Very complicated poses can be simplified by beginning with an “envelope” to indicate the area that the figure occupies, as well as the major angles of the pose. These are but a few examples of the possibilities. There is usually more than one correct answer. After all, drawing figures is not solely an analytical activity, but an interpretive and intuitive one as well. However, within the myriad of possible correct answers, there may be a most efficient and effective way of beginning a drawing, which will become easier to identify with practice. 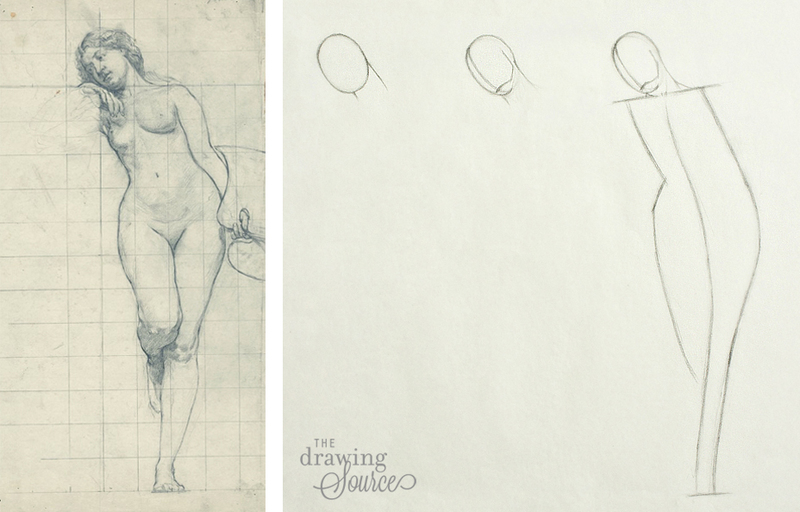 Let’s look at five strategies to “solve” the beginning of a figure drawing. 1. You can begin drawing figures with the head and neck. 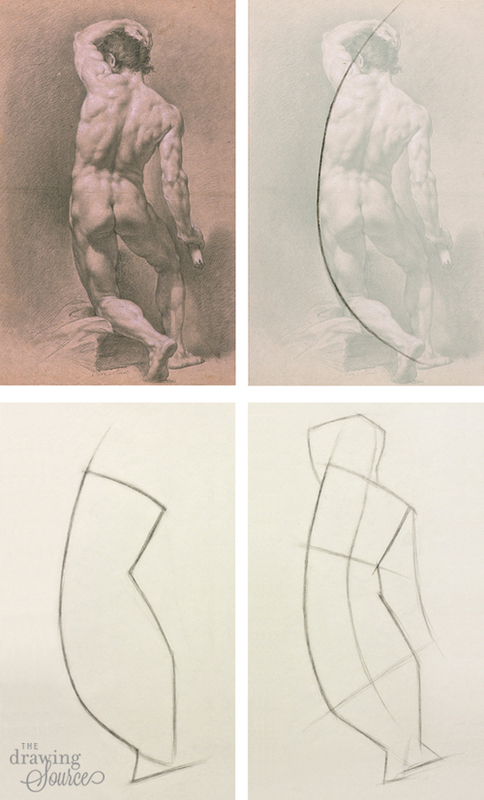 Perhaps the most common and logical way to begin a figure drawing is to work from top to bottom - to initially indicate and place the model's head. 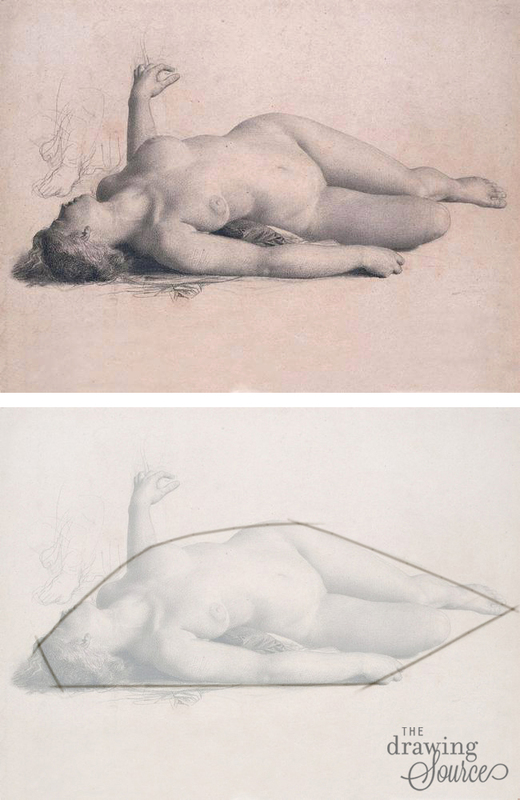 If I were to draw a pose such as the one in the above drawing, I would begin by indicating the general shape and angle of the head with a simple oval or egg. Notice that my oval does not include the hair. The egg shape represents the skull, upon which the hair will be added later on. Once I have established the general shape, I give the oval the correct tilt and a sense of perspective by drawing the center line of the face and indicating the chin and jaw lines. Notice how this minimal information establishes the position of the head in space and starts to create a sense of three-dimensionality. It is good practice to build up all areas of a drawing simultaneously so that there is ample opportunity to compare the proportions, angles and accuracy of the drawing before delving into further detail. Following this principle, I leave the head at this point to move on to the line of the shoulders, paying particular attention to the angle of the shoulders and the distance between the chin and the shoulder line. When I am confident in the angle of the shoulders, I move on to drawing the main action line and gesture of the pose, and placing the feet. In this second example I have used the same strategy: I began with a basic oval shape for the head. To clarify the position of the head in space I indicated the chin, jaw and center line of the face. I then located the line of the shoulders before drawing the main action line of the pose, placing the feet to establish the height of the figure, and drawing the center line. The tilt of the head and angle of the shoulders are often important in establishing the gesture of a pose. You can extend a plumb line from the head to determine how far in each direction the body extends. In the above drawing, do you see the vertical line that runs through the figure’s nose? You can use it to place the figure’s hip, for example, by observing how far to the right of the plumb line the hip is located. Observing the negative space between this plumb line and the outline of the figure can also help you achieve a more accurate drawing. The head can also be used as a unit of measurement to determine the height and width of the pose, as well as many of the smaller proportions on the figure. 2. 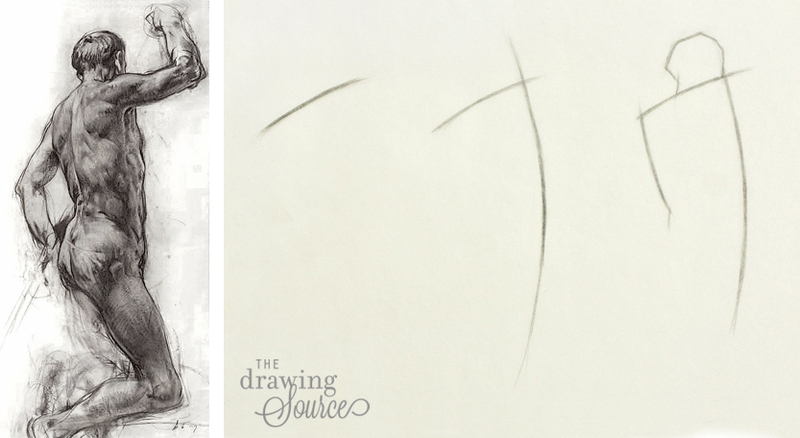 You can begin drawing figures with the shoulder line. 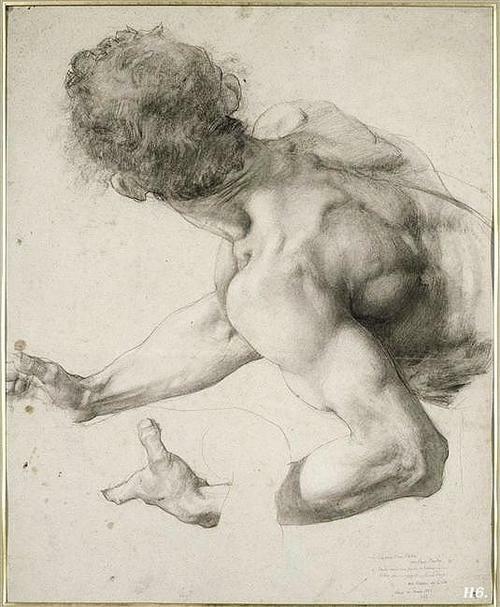 In poses where the shape of the head is partially or completely obscured and the line of the shoulders is a more prominent feature, the latter can be an ideal place to begin the drawing. How do you find the line of the shoulders? When viewing the figure from the front, the line of the shoulders is found along the visible line created by the clavicle bones, below the triangular outline of the shoulders created by the trapezius muscle. Muscles lie on top of the skeletal structure of the body. 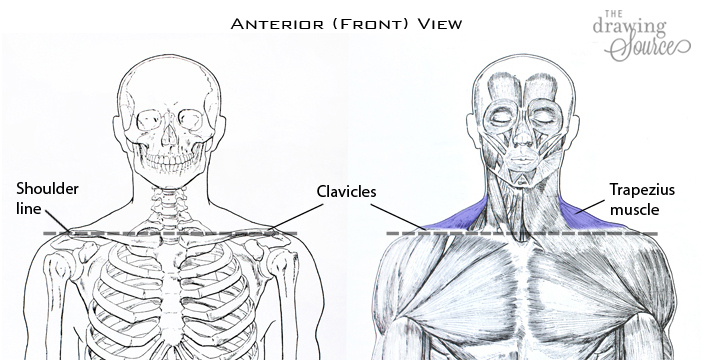 We can mimic this order in our drawings by indicating the line of the clavicles first, and adding the trapezius muscle on top of that construction line later. When viewing the figure from the back, look for the point of the shoulder where the clavicle meets the acromion process of the scapula. 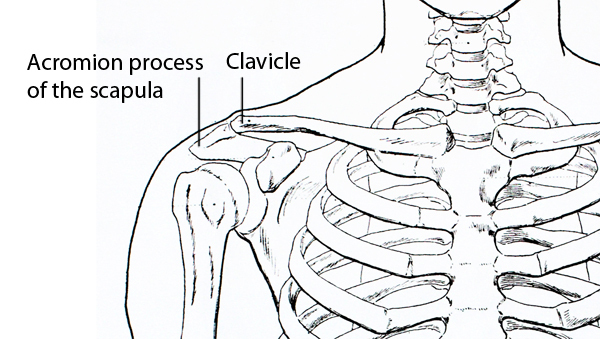 This is usually fairly easy to locate because there is a protrusion which can often be seen on the surface of the body, right where the clavicle ends and articulates with the scapula. On some people, the angle of the shoulder straightens out considerably in this area, making the line of the shoulders easier to locate. Connect these points on both shoulders with a straight or arcing line to find the shoulder line. When a pose has a very distinct, expressive movement that you want to communicate, you may choose to begin with a gestural line that describes the major action occurring in the pose. An easy way to identify this major action is to ask yourself, "What is the figure doing?" or "What is happening in this pose?" In this case the figure is seated on a chair, leaning slightly forward and to the left, and looking at the ground. One leg is extended forward while one is flexed back. I can describe this movement most simply by drawing a sweeping C-curve that begins at the head, curves around the torso and continues on to connect the torso to the sole of the foot. Notice the repetition of this movement in the left side of the body and in the curvature of the spine. Once I have established this movement, I can find the angle of the shoulders, the shape of the head, and where the torso ends. The arms and legs can be indicated initially with gestural lines. In this similar scenario, the main action line in the above drawing is a sweeping C-curve that is repeated in the right side of the body, the spine, and even in the position of the right arm. After drawing the overall movement of the pose with a gesture line, I move on to find the line of the shoulders, the opposing compressed action in the right side of the body, and the feet. 4. You can begin drawing figures with a shape. Poses that are compressed or foreshortened (for example, when the figure is seated or reclining) may not have a long, sweeping major action line. Instead, their gesture may be best communicated by drawing the shape that the pose fits into. You can start these types of figure drawings by blocking in a specific shape, paying close attention to its proportions and angles (the triangle below is not an equilateral one!). Then, imagine that you are a sculptor chiseling away excess areas of the triangle to reveal the form of the figure. 5. 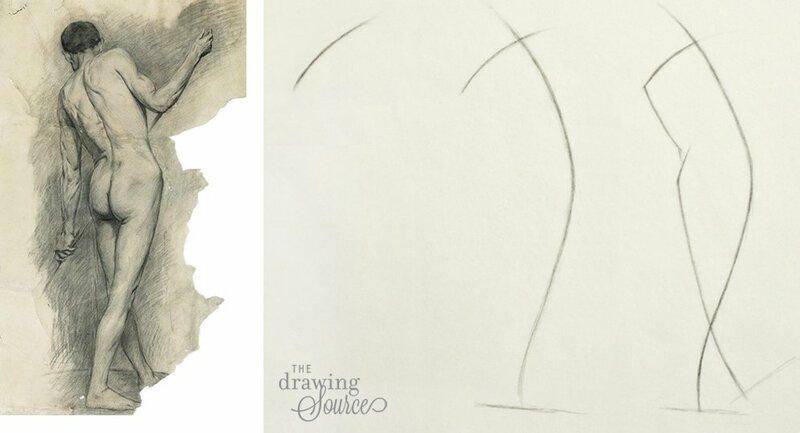 You can begin drawing figures with an "envelope". As the title of this strategy suggests, an “envelope” envelops the pose. I use the envelope when drawing a challenging pose that I want to begin more analytically rather than intuitively, in order to increase my chances of drawing it accurately. Similar to the above shape method, the envelope shows us the area that the figure occupies. To draw the envelope you can use straight lines, curved lines, or a combination of the two to map out the boundaries of the figure. Notice that a new line begins wherever there is a major angle change in the pose. Taking your time to observe and draw these elements will create a successful foundation for the rest of your block in, the construction of the figure, and the eventual rendering of the drawing. Begin with what inspires you. What you begin with depends on what is most important to you in the pose. Before you even pick up your pencil, first identify what interests you: Why do you want to draw this pose? What is it that inspires you about this particular pose that you wish to communicate in your drawing? If it is the dynamic movement, for example, then perhaps begin with a gesture line to express that idea with your initial pencil marks. Start with the easiest, most evident variable. You can also begin with whichever variable is most evident to you. Which element from the above list of “must-haves” do you think will be easiest to draw accurately? If the shape and tilt of the head seem clear and obvious to you, for example, begin there. Perhaps it is the distinct angle of the shoulders that stands out to you. 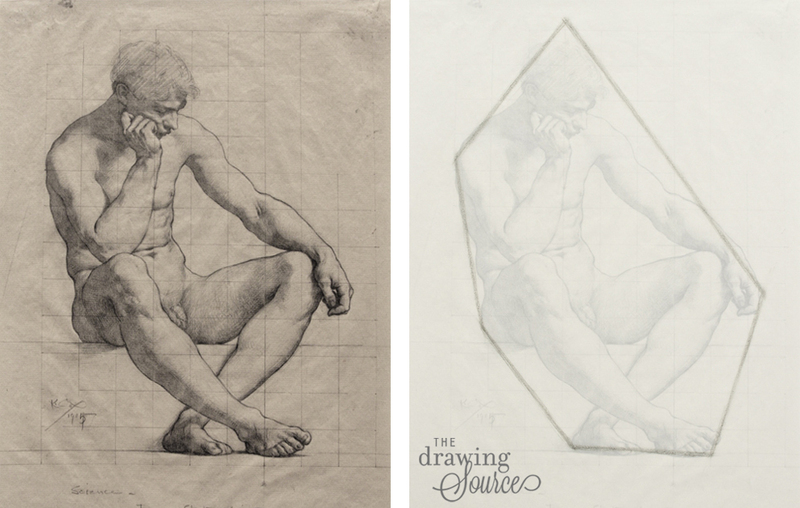 With practice, determining how to begin your drawing will become a creative and exploratory endeavor. 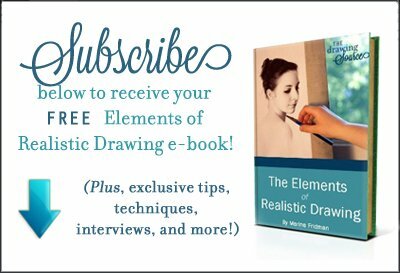 Improve your drawing skills with the free Elements of Drawing E-Book, exclusive tips, techniques, interviews, and more! BY MARINA FRIDMAN COPYRIGHT © THE DRAWING SOURCE 2019. ALL RIGHTS RESERVED.